Heads Up! Another asteroid passes earth tonight. Tonight’s heavenly viewing is 1998 QE2 and is the size of nine Cruise ships and the size of the Golden Gate Bridge!! Now that’s big! 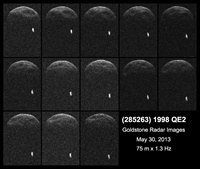 This asteroid will be pass approximately 3.6 million miles from earth tonight. According to NASA’s Near Earth Object Program will not be this close to earth again for 200 years. This asteroid has its own moon accompanying it and is 2000 feet wide and spins itself once very 4 hours. The last significant asteroid to pass earth was on February 15 of this year. 2012 DA14, as it is known, passed earth 17,200 miles away. Everyone was watching for the asteroid, but no one saw the meteorite that exploded 12 miles above Russia that same day! To which I say, “In God I Trust!” As the sun goes down and the asteroid comes into view, Shabbat Shalom.